Tackle the most pressing bathroom plumbing problems a homeowner is likely to face with these fast, simple remedies. If there’s one household fixture we really rely on—and hate to have to fix—it’s the toilet. 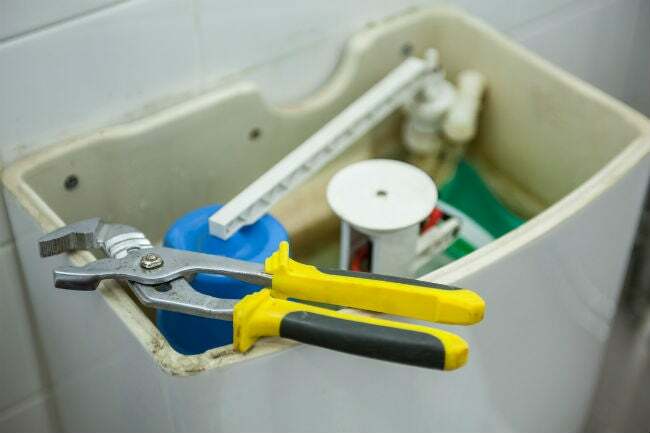 But while these fixtures are prone to acting up now and then, the good news is many common toilet repairs are do-it-yourself-friendly, requiring few (if any) basic hand tools. So if your toilet is giving you trouble, you’ve come to the right place. Check out the likely issues here and learn how to quickly correct them without calling a plumber. A clogged commode will cause the bowl to overflow onto the bathroom floor, but the fix—which happens to be the most common of all toilet repairs—doesn’t have to ruin your day. Clearing the clog is super simple, and you probably have a toilet plunger already on hand. Simply insert the plunger into the bowl while it’s still full of water, pressing the mouth of the plunger firmly against the opening at the bottom of the bowl to form a seal. Then use a rhythmic push-and-pull pumping motion to create pressure in the drain and free the clog. Don’t be overly enthusiastic; forceful plunging is likely to splash dirty water all over the bathroom. After eight to 10 pumps, lift the plunger away from the bottom of the bowl. If you’ve freed the clog, the water will drain—it usually takes just one or two attempts to free a clog. If you depress the handle but feel no resistance and the toilet fails to flush, either a connection or the chain inside the tank has most likely come loose. Not all tank interiors look exactly alike, but all feature a lift arm (a thin metal or plastic rod) and a rubber stopper at the bottom (called a “flapper”), which connects via a chain to the lift arm. If the chain comes unhooked from the lift arm, the flapper won’t lift to allow water to drain from the tank, preventing the flush. The same problem can occur if the nut that secures the handle to the lift arm (just inside the tank) has worked loose. A simple four-step toilet repair will get your bathroom back in working order. 1. Turn off the shut-off valve that supplies water to the tank located on the small hose behind the commode. 2. Remove the tank cover. Locate the chain connected to the flapper and pull it upward. This will lift the flapper and allow the water in the tank to drain out. 3. If the chain has come loose from the lift arm, reconnect it (you should see a notch or a hook). If the chain has broken, buy a new one from the hardware store (for less than $5) and replace it. 4. If a loose or broken chain isn’t the problem, the nut that secures the handle (just inside the tank) may have loosened and worked its way down the lift bar. Retighten the nut to the back of the handle, using your fingers, until it’s snug, and then turn on the water supply to refill the tank. If you continue to hear water running in the commode when the tank has refilled after a flush, give the handle a little jiggle. If the running water stops, the problem is a faulty flapper. When new, the flapper is flexible and seals tightly in the drain at the bottom of the tank, settling easily back into place after every flush. Over time, however, the rubber can harden and the flapper won’t fit as snugly into the drain. Replacing the flapper should be just the right toilet repair. 1. Turn off the water supply and drain the tank as described in the repair above. 2. Remove the old flapper. Flappers connect in various ways, either with plastic hooks that snap onto a small bar on the overflow tube (a vertical cylinder positioned next to the flapper) or via a ring that slips over the overflow tube. Either way, you won’t need any tools to take it off. 3. Bring the defunct flapper to your local hardware or plumbing supply store to get an exact match. A new flapper will set you back $10 to $25, depending on the style, and it will come with a new chain. 4. Install the new flapper using the same method you used to remove the old one, then connect the new chain to the lift bar. Running water problem solved! Pooling water around the base of the toilet is always a cause for concern, and it’s often the result of a leaking wax ring seal. To test if the wax ring has gone bad, squirt some food coloring into the toilet bowl and then flush the toilet. If colored water runs out from around the base, you’ll have to replace the wax ring. No need to size-shop, as wax rings are one-size-fits-all standard toilet flanges and are readily available at hardware or plumbing supply stores for about $5. While replacing the ring is a fairly simple DIY project, it involves physically lifting the entire toilet, which can weigh anywhere from 70 to 125 pounds depending on size and style. Such types of toilet repairs will require a strong back or, better yet, a helper. 1. Turn off the water supply and then flush the toilet to drain the tank and bowl. Some residual water will remain after flushing—be sure to bail it out with a cup or use a wet-type vacuum. 2. Disconnect the water supply valve from the bottom of the tank by twisting the nut loose where the hose meets the tank. If unable to do this by hand, use a crescent wrench. 3. Use a flathead screwdriver to pry off the plastic caps that cover the toilet bolts on either side of the bottom of the base. 4. Remove the nuts that are now visible from the toilet bolts, using a crescent wrench. Once the nuts are off, the toilet is no longer connected to the floor. 5. Lift the toilet, base, and tank together, straight upward and off the bolts, and then set it aside on some cardboard or old towels protecting your bathroom floor. 6. Use a putty knife to scrape off the old wax from the flange—the top of the drainpipe that is now visible. The old wax will probably come off in chunks. It’s important to remove all of it from the flange. 7. Center a new wax ring the flange, taking care not to nick it or dent it. It will be soft and pliable. Gently press it in place with your fingers. 8. Reset the toilet by lowering it straight down with the base holes aligned over the protruding toilet bolts. It’s important to keep the toilet base level as you set it or you could damage the wax ring and have to do the whole thing over again. Recruit help, if necessary, to set the toilet. 9. Replace the nuts on the bolts, tightening them snugly with the crescent wrench. 10. Cover the nuts and bolts with the plastic caps. 11. Reattach the water supply hose to the connection at the base of the tank and turn the water supply valve back on. If the toilet starts to flush but then stops, the chain may be too loose (causing the flapper to close prematurely) or the fill valve may be allowing insufficient water into the tank. 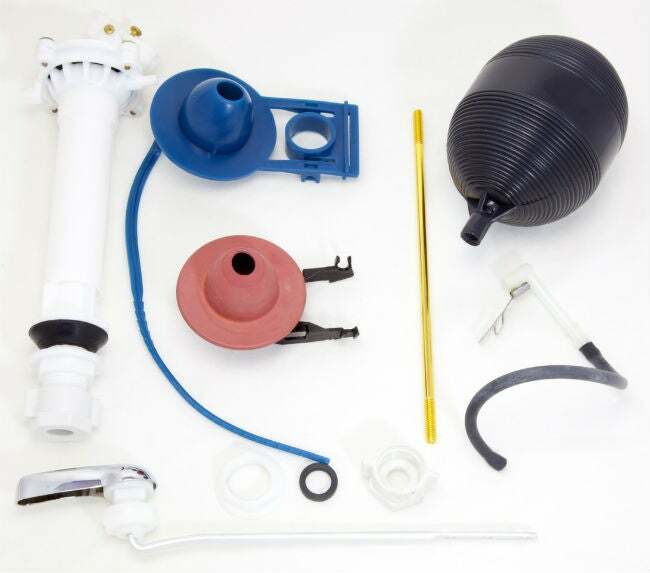 Here, toilet repairs can be as simple as adjustments made to these components. If you find yourself having to hold the handle down for the entire flush, the following steps will get your commode flushing correctly again. 1. Remove the tank lid and flush the toilet. If the flapper drops back into place before the end of the flush, remove some of the slack from the chain by hooking it one or two links higher on the lift bar. If the problem persists, continue with the following steps. 2. Watch the tank as it fills back up with water. When full, note how high the water level is compared to the top of the overflow tube (the vertical cylinder the flapper connects to). If the water level is lower than one-half inch from the top of the overflow valve, there probably isn’t enough water in the tank to completely flush the toilet, so you should adjust the fill valve to raise the water level, which will provide more water for each flush. 3. Locate the fill valve—whose purpose is to let water fill the tank until it reaches the desired level—directly above the spot where the water supply tube connects beneath the tank. The fill valve in your tank may have a large float on the end of a bar that rises as the water level rises, or it may have an air-filled case that fits directly on the fill valve post that rises as the water rises. 4. Find the fill valve adjustment screw on the side near the top. By turning the adjustment screw slightly one way or the other, with a screwdriver, you can adjust the level of water in the tank. It may take a little experimenting and repeated flushing to get it just right.